Residents protest at the East Harlem rezoning forum. HARLEM — Community activists shut down an East Harlem rezoning forum on Thursday in protest of an effort to dramatically redraw the neighborhood. 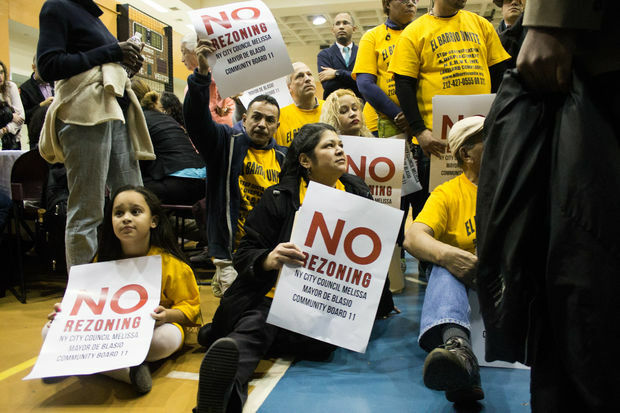 Residents packed the gymnasium at Taino Towers but, before speakers from the city Department of Planning could present their plan, protesters took to the floor with a bullhorn to oppose the rezoning. Residents from Community Voices Heard demanded that the city first put $200 million towards repairs for existing New York City Housing Authority properties and lower levels of affordability for new developments. "We're demanding that 30 percent of the new units built on public land are for low-income residents," said one woman from the organization. "And by low-income, we mean $23,000 and less." The city laid out a rough rezoning proposal, which in some areas would include buildings as tall as 35 stories and development on NYCHA land. El Barrio Unite also protested the meeting, opposing the plan and confronting speakers including Deputy Manhattan Borough President Matthew Washington and George Sarkissian, a rep from Council Speaker Melissa Mark-Viverito’s office. “We totally reject the bulls--t of rezoning,” said Roger Hernandez, of El Barrio Unite. Calvin Brown, a representative of the City Planning Department, tried to quell the objections. “Your concerns are very important to us, that’s why we’re coming out here,” he said. He said the city is planning a “targeted approach” to address the affordability concerns. He added that the rezoning would allow the city to remove restrictions and allow additional opportunities for affordable housing. But residents didn’t buy it, blasting the mayor and Mark-Viverito for not doing enough to protect low-income residents regarding developments in the neighborhood. Marina Ortiz, of East Harlem Preservation, called for a citywide moratorium on rezoning. “The city needs to get its own house in order before it starts to displace ours,” she said.